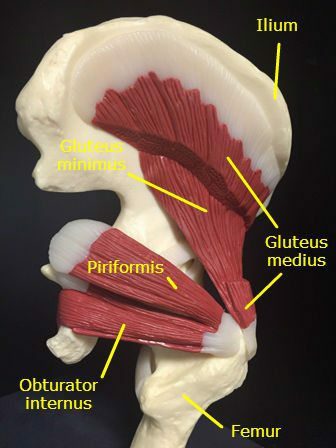 The piriformis muscle (PM) is well-known in medicine as a significant muscle of the posterior hip. It is a muscle that has a role in controlling hip joint rotation and abduction, and it is also a muscle made famous due to its ‘inversion of action’ in rotation. The PM also garners attention due to its role in ‘piriformis syndrome’, a condition implicated as a potential source of pain and dysfunction. Piriformis syndrome can be defined as a medical condition in which the piriformis muscle, located in the buttock region, spasms and causes buttock pain. The Sciatic Nerve may be irritated by the interaction between the SN and the PM producing posterior hip pain down the posterior thigh, imitating ‘sciatica‘. Complaints of buttock pain with referral of symptoms are not unique to the Piriformis Muscle. Symptoms are widespread with more clinically evident back pain syndromes. It has been indicated that piriformis syndrome’ is accountable for 5-6 percent of cases of sciatica. In the majority of instances, it happens in middle-aged individuals and is far more prevalent in women. The PM originates on the anterior surface of the sacrum and is anchored to it by three fleshy attachments between the first, second, third and fourth anterior sacral foramina. Occasionally its origin may be so broad that it joins the capsule of the sacroiliac joint above and with the sacrotuberous and/or sacrospinous ligament below. PM is a thick and bulky muscle, and as it passes out of the pelvis through the greater sciatic foramen, it divides the foramen into the suprapiriform and infra-piriform foramina. As it courses antero-laterally through the greater sciatic foramen, it tapers out to form a tendon that is attached to the superior-medial surface of the greater trochanter, commonly blending with the common tendon of the obturator internus and gemelli muscles. The nerves and blood vessels in the suprapiriform foramen are the superior gluteal nerve and vessels, and in the infra- piriforma fossa are the inferior gluteal nerves and vessels and the sciatic nerve (SN). Due to its large volume in the greater sciatic foramen, it has the potential to compress the numerous vessels and nerves that exit the pelvis. PM is closely associated with the other short hip rotators that lie inferior such as the superior gemellus, obturator internus, inferior gemellus and obturator externus. The primary difference between the PM and other short rotators is the relationship to the SN. The PM passes posterior to the nerve whereas the other otators pass anterior. Tight and shortened muscle fibers precipitated by muscle overuse such as squat and lunge movements in external rotation, or direct trauma. This increases the girth of the PM during contraction, and may the source of the compression/entrapment. Sacroiliac Joint Dysfunction (SI Joint Pain) causing PM spasm. A tight or cramping sensation in the buttock and/or hamstring. Aggravation from sitting and squatting. Peripheral nerve symptoms i.e. pain and paraesthesia in the back, groin, buttocks, perineum, behind thigh. When it is believed that piriformis syndrome exists and the clinician feels that a diagnosis has been made, the treatment will usually depend on the suspected cause. If the PM is tight and in spasm then initially conservative treatment will focus on stretching and massaging the tight muscle to remove the PM as being the source of the pain. Local anaesthetic block – performed by anaesthesiologists who have expertise in pain management. Steroid injections into the PM. Botulinum injections into the PM. Therapist-directed interventions such as stretching the PM and direct trigger point massage has always been advocated. 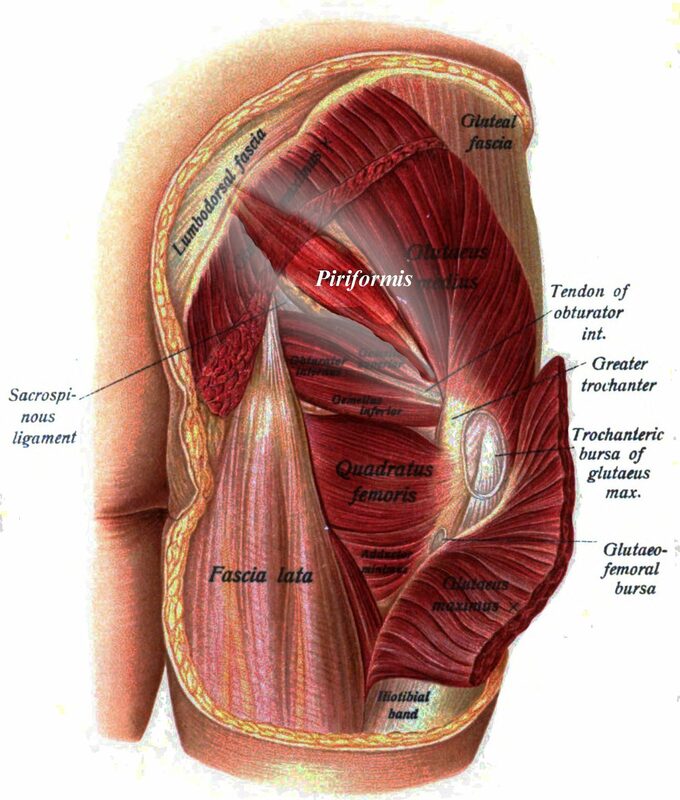 The piriformis muscle is a really strong and powerful muscle that runs from the sacrum into the femur. It runs beneath gluteal muscles the nerve travels beneath them. If this muscle goes into spasm, then the nerve creates radiating pain, numbness, tingling, or burning out of the buttocks to the leg and foot. Other people develop the syndrome while dealing with chronic low back pain. Activities and motions that cause the piriformis muscle to contract further compress the sciatic nerve, causing pain. This muscle contracts once we squat, or stand, walk , go up steps. It tends to tighten when we sit at any position for more than 20 to 30 minutes.